This constellation of small mirrors acts as a swarm, like bees or mindless cells under the microscope. 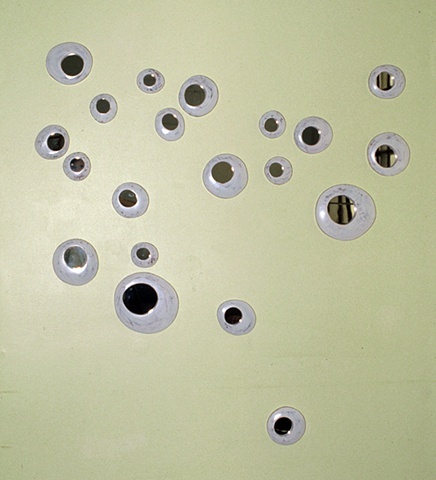 The title, "Flock", describes both the group and their behavior. This installation creates a mosaic of light like a smattering of sequins across a wall or stars across the sky. Rather than getting a full view of oneself, a partial, multi-perspective view is offered. In his essay "Objects Built in a Realm of Total Permission: Studio Furniture and Its Strategies", American furniture historian Glenn Adamson calls Flock one of "the strongest of Eriksmoen's pieces in the show [which] derives its effectiveness from its simplicity . . . the work's usage and physical construction are fundamental to its content, which is all about fragmentation of the viewer's image into a welter of tiny parts."